Whew! This past weekend I was so glad the air conditioning was going strong and not in need of an AC repair at the Tampa Bay Comic Con 2014. 40k super fans from the Tampa Bay area and beyond gathered at the Tampa Convention Center for an all out nerdtastic play date of costumes, celebrity Q&A, breakout sessions and nearly 400,000 sqft. of expo space for the whole family! That’s right, you can now use your 6-year-old as a cover while you scope your favorite superheros, and stock up on your favorite big kid toys. In my mind, that plays out perfectly. Not to mention I’ve yet to meet a 3 1/2′ Superman I didn’t like. While most sane people were sleeping, I came down super early to meet a few of the artists before the doors opened. I actually think I made some friends here! I really enjoyed having the chance to talk to some of the artists about their travels, where they find inspiration, and what cons they’re headed to next. Some of the artwork in the Cursed Pirate Girl by Jeremy Bastian. The artwork in this book is beyond stunning. Brandon Peterson doing some line work at his table. I loved Michael’s large paintings. I am a huge horror movie fan and these really spoke to me. No two are alike! “You know nothing John Snow!” John Snow done by Jacob McAlister. I loved this screen print. It must be mine. One of my favorites. Will Pigg works with paper craft, charcoal, and print. I’m looking forward to seeing his fairytale set coming soon. Will and Jacob being silly. Comic Con is a good time every where you turn. I LOOOOVED Jaime’s little “meownicorns” these things melted my heart. Her whimsical artwork made me all warm and fuzzy. Morgan Wilson in front of her latest work. Check out her pretty painted ladies. I love Morgan’s rendition of Maleficent. Dredmor’s Plunder. Coming soon, a feature on his totally sweet leather wrapped mugs with metal working. Daenerys Targaryen’s dragon eggs by Tammy Pryce. I have met her several times and I love her little dragons. You’ll never truly gather the lung capacity of a 14 year old girl until Richard Madden walks into a room. Holy eardrums. The famed Game of Thrones (now dead), King of the North graced the adolescent masses at Tampa Bay Comic Con for a series of autographs ($50), photographs ($50), and a Q&A with Pedro Pascal. Between the two it was a swoon fest. It was hard to compete with questions like “What color are your underwear?” and “Will you follow me on Twitter?”, but I barreled through and went in for the win, seized my moment and asked him about Ireland’s new Game of Thrones Territory and if he had any favorite locations along the trail. Bring a jacket! Ireland is beautiful, it’s a lovely place. It’s not too far from home in Scotland for me and so while I was there I liked being on the coast. On a clear day you can actually see Scotland. It’s just a beautiful area where we filmed.” -Richard Madden, Game of Thrones, Klondike, Cinderella (2015). Richard Madden and Pedro Pascal having some fun on stage, laughing at the wealth of ridiculous questions pouring from the audience. Just when I thought my decibel capacity had reached its max, Evan Peters came into the room. The American Horror Story and X-Men star had yet another (or perhaps even the same) group of swooning girls pouring into the room to ask him questions like “Who’s your favorite Hollywood couple?” and “Can I have your number?”. They just don’t stop, it’s madness! I was able to squeeze by the trembling tweens to ask him if he had any advice for the Little Fairytale Traveler as he enters a career in television. Evan Peters was hilarious. He answered the Q&A with a sense of humor, despite the myriad of innuendos made right in front of his mother. Lord of the Rings, though they are both absolutely amazing films, I have to say this due to the literary roots of Lord of the Rings. J.R.R. Tolkien was a profound author. -John Rhys-Davies, Lord of the Rings, Indiana Jones, Spongebob Squarepants. John Rhys-Davies was a delight to listen to. He spoke about everything from Lord of the Rings to Indiana Jones. Tampa Bay Comic Con 2014 also featured celebrity appearances from Caity Lotz of Arrow and Mad Men, Brighton Sharbino of the Walking Dead, Kyla Kenedy of the Walking Dead, and Daniel Cudmore of X-Men: Days of Future Past, X2, and X-Men: The Last Stand. For a complete list of celebrity appearances click here. There was no shortage of talent at Tampa Bay Comic Con. It seemed like the was a small mob at every corner enjoying photo ops with their favorite fantasy, comic, superhero, cartoon, and movie characters. I’m not going to lie, I was right there with them! The day after the opening of Guardians of the Galaxy and I got to see Peter Quill, Groot and Rocket all in one! Maleficent and Bane. An odd pair lol. I had to get my shot with Stewie. This zombie girl was awesome! I love zombies. Tampa Bay Comic Con was a blast. I would have liked to see more food options there, but that was probably just the convention site. Besides, who needs food when there’s killer costumes, zombies, toys, comics, and celebrities? The weekend was a whirlwind of awesome. We are totally looking forward to the next Comic Con, and hope to see you there. Till then, my new office wall art will have to do. There’s no shortage of creative here. 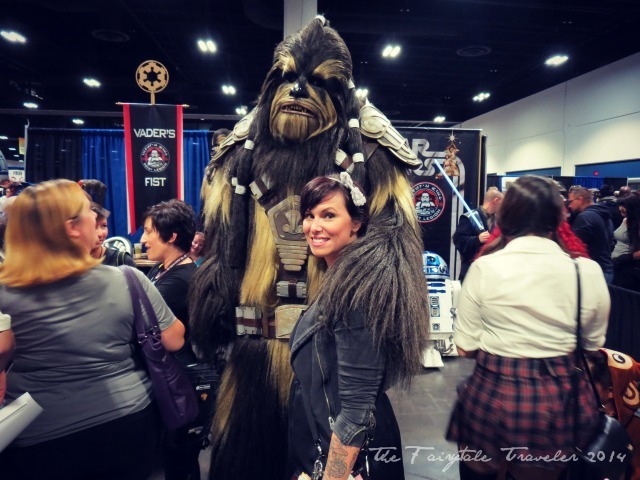 Want to Plan for Tampa Bay Comic Con 2015? You can start by checking into the convention hotel at Embassy Suites conveniently located across the street from the Tampa Convention Center. Its catwalk will take you over the street and land your comic book, nerdism loving feet right at the convention. Embassy Suites has valet parking (the way forward) for $13 (check for up to date prices), an in-house Starbucks with wi-fi, with breakfast included and afternoon refreshments. Equally as convenient as its location is the Tampa Trolley just in front of the entrance which will take you straight into historic Ybor City for the after event shin-digs. If you’re wanting to stay put, you can walk across the street to the outdoor bar and catch the sunset on the bay. If you’re looking for a spot that requires a few more buttons on your shirt, stroll over the itty bitty bridge to Jackson’s on the water. Dine by day, party by night. Embassy Suites and the Tampa Convention Center are located in one of the prettiest parts of downtown Tampa on the water overlooking the premiere residential neighborhoods of Harbor Island. Conveniently located directly across the street from the Tampa Bay Convention Center. The trolley out front will take you to Ybor City. Wanna Get Your Nerd on Sooner? Thank you for sharing this incredible experience! Meeting you was definitely one of the best things to come from my time at TBCC. I’m glad you had a good time–Tampa Bay Comic Con is among the most well-organized events I attend and it’s good to hear that everyone had a blast!!! do you have any pictures you didn’t publish from tampa bay comic cin 2014? I’m trying to find pictures of lucasfilm London crew that were there incldovding Mathew denton, Joshua lee, oliver steeples, and lee towerzy. I’m sure I do… what’s your email?